How Dare Fat Westerners Perpetuate Slavery? I usually try not to be angry when writing nowadays, but this time, I am making a calculated exception. It has become a trend lately – in the Western world, I should add – to argue AGAINST Fairtrade. All sorts of fine economical arguments are presented; we write about the latest addition from Sweden to this case in Foodwire today. This just makes me really, really angry. While the organisations behind the Faitrade idea need to be consistently scrutinised and examined – it has happened before, and will happen again, than charitable organisations fall into temptations of embezzling money, and other misbehaviours – attacking the whole idea is something only a fat, lazy and ignorant Westerner, safely holed up behind his/her cuddly desk with as little contact as possible with the real world, could do. For starters, ever since I started writing about the food industry in 2000, I have regularly written reports about outright slavery in the cocoa growing trade. Yes, slavery, a few hundred years since we abolished that practice in our cosy corner of the rich world. We are talking about children being trafficked, beaten, and exploited, just so you and me can enjoy nice little chockies at a few cents less that we’d otherwise have paid. And we’re talking about reports that are so well-founded that they have forced the world’s largest chocolate manufacturers – albeit kicking and screaming – into attempts to do something about it. (So far, very little has been done, though). Real lives being ruined. Real little kids having their tender backs ripped open by whips of ruthless adults. Do the crying and disillusioned faces of these children ever show up in the figures of these Western economist’s calculations? Moreover, it is always conveniently forgotten that very tempting alternative crops for e.g. coffee growers, should coffee prove unprofitable, are high-paying products such as coca bushes or opium poppies. Crops that pay far higher per kilo, and thus yield more profit per mile as they are carried on labourers’ backs in roadless areas of countries like Colombia. Do the crying and disillusioned faces of the drug addicts of the Western world ever show up in the figures of these Western economist’s calculations? Maybe some people should lift their fat backsides and take field trip into the real world. Or, if they support the aforementioned facts that fair trade seeks to avert, why not sell their own children into slavery and drug abuse? Let the neo-cons do that if they wish, but stay away from my kids and the children of those cocoa, tea and coffee growers toiling for less than these Western vultures earn in the time it would take them to read this blog post. There was something about the football game table. You know, the kind where you have little wooden footballers on sticks. Not that it was old and shoddy, but that it had ashtrays. Yes, plural. Not one, but four built-in ashtrays; one in each corner. This is hardly anything that would make most people raise their eyebrows the way I did. But, having lived for many years in Sweden, I’m still used to the mix of athletics and smoking or drinking being a complete taboo. And when I say complete, I mean complete, man. The picture was compounded by the fact that the battered but smoker-friendly football game table was – and still is – wasting away in a corner of the private pub that my eldest son’s football club has just by the side of the football pitch. There, the parents can happily sit and comfortably booze away, while their five- and six-year-olds struggle along in the October cold, rain and dark outside. Such a mix of sports, very young children, alcohol and smoking will usually make most Swedes faint, and would have been completely inthinkable there. In fact, even having brewers sponsoring a football team – which is the standard procedure here – would have Swedes rioting outside, and serving alcohol on private premises where little children learn football would probably result in calls to the local police. To draw a comparison for any of you American readers, this would have been the equivalent of having a private adult film shop next to the soccer pitch. Same thing when we are invited to the yearly parental meeting at the school which both our six-year-old and our four-year-old attend. The parents are usually served a welcome drink – we get a choice of wine, champagne, or juice – and can have a happy sip or two before touring our kiddies’ rooms and listening to their teachers. Belgians think nothing of it. Swedes would have launched a full investigation. On Governmental level. And this wasn’t even in Sweden, but in London. Every country has its taboos, and every taboo has its reasons. The Swedish taboo surrounding alcohol comes from the fact that it is the country where you have to empty any bottle you take the topo off. I mean, when I read about my felow Britons complaining about the noise around pubs late at night, I just sigh and think “you ain’t seen nothing yet, pals”. Living close to the centre of a large town in Sweden, as we did before coming here in 2004, meant Ragnarök every Friday and Saturday evening. Noise ad nauseam, vomiting in the bushes, people urinating anywhere and everywhere, and hardly a sober person in sight. In a country where booze is only sold in restaurants and special state-owned shops, that is. Here, where it’s all sold freely at the supermarket, and we have five pubs within five minutes’ walking distance from where we live (it used to be six until just recently), you virtually never see anyone visibly intoxicated. If anything, the Belgians take a more pragmatic stance. “It’s our biggest source of income”, a friend and parent of another kid in the same football team told me when I raised the issue of the soccer pub. “The main team plays in such a low division that there’s only about 100 spectators at the matches, but afterwards, everyone gathers together for a drink”, he said with a chuckle. I couldn’t help but post this video clip here as well, which I first found on my boss’s blog. Absolutely hilarious! I shall end this working week, Friday the 13th and all, by warning you of the world’s biggest killer: Dihydrogen Monoxide. A chemical compound which takes thousands of lives each year, yet is used in industries and homes alike. “Dihydrogen monoxide… is the main component of acid rain… may cause severe burns, contributes to the erosion of our natural landscape”, yet it is used “as an industrial solvent and coolant… as a fire-retardant… as an additive in certain ‘junk-foods’ and other products”. Covering the food industry and related issues, I am daily inundated by various reports about health effects, or, more commonly, dangers caused by this-or-that substance. In some cases, fears may be well-founded, but the alerts are more often than not offset by counter-reports weeks, months or years later. Sometimes item x is good for you; next week another report claims it makes you ill. That is why I rarely, if ever, write on such reports, unless there is massive reason to do so. More often is it relevant to write about the effects on sales and public worries that such reports have caused. Moreover… it is only too easy to fall for sloppy research, if you’re simply a journalist with no scientific knowledge. There is every reason to be cautious. That’s one reason why the EU, and national authorities, try to examine all evidence for or against various food items before banning or recommending them. 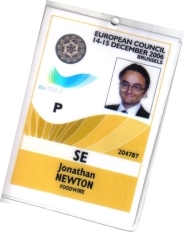 One such question currently underway is whether cloned food should be allowed for human consumption within the EU. That’s an issue that worries a lot of people – but on the other hand, it’s technically all about copying an organism already proven safe. So, is it dangerous… or is it just our emotions that cause our gut reactions to avoid it? So, still worried about the dangerous chemical Dihydrogen Monoxide, and prepared to sign up to call for its ban? Then read more here. This is a site I check regularly, and would like to recommend you to do, too. I especially like the last paragraph about how a California muncipality almost passed a law banning the substance. Today, I can disclose a breaking news item: EU Commissioner Viviane Reding likes champagne. This was announced by her spokesman Martin Selmayr today, as it became virtually clear that the extra charge you pay for calling and receiving calls on your mobile phone when travelling between European countries will be drastically slashed, in time for the summer holiday season. The EU Parliament’s Industry Committee today voted in favour of cutting these roaming charges by about 70 per cent, and if all the rest goes according to plan, the new rules will come into force in July. “I just spoke with Commissioner Reding, who is in China, and informed her about the vote, and I can tell you that she opened a bottle of champagne after hearing about the vote”, Mr Selmayr told the amused journalists. “Again, I’m surprised about your skepticism”, Mr Selmayr smurked. “If you knew Commissioner Reding, you would know that she would never miss such an opportunity”. You can watch the whole thing by clicking here; choose “Thursday 12/04/2007”, scroll down the page and click on “12:46:01”. The all-important question about Ms Reding’s drinking habits comes at 12:53:26. 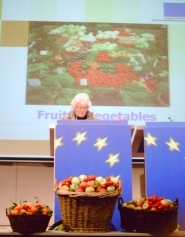 Of course, given the fierce fight the EU has put up to ensure that nothing produced outside of the Champagne region in France can be called “champagne”, one must assume that Ms Reding was able to get a genuine bottle on location, or had brought her own supply (however she managed to get that past security). Arrggh, I should have asked some kind of spanner-in-the-works question about that. Sorry, I didn’t think of that until now.